Every day we use machines that require energy. Cars and buses get energy from oil. Televisions and microwaves are powered by electricity made from coal. And furnaces rely on natural gas. Oil, coal, and natural gas are fossil fuels. Fossil fuels formed underground from plants and animals that died long ago. But did you know that fossil fuels pollute the planet? And they are non-renewable. This means they wont last forever. We must join together in the quest to find and use Earth-friendly energy sources. 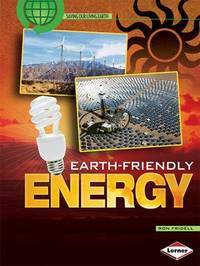 With engaging text and eye-catching imagesplus a special Going Green sectionthis book tells you all about Earth-friendly energy and what you can do to promote it.